Proper eye protection is a must for anyone looking up at a solar eclipse. Eclipse glasses are far darker than regular sunglasses. 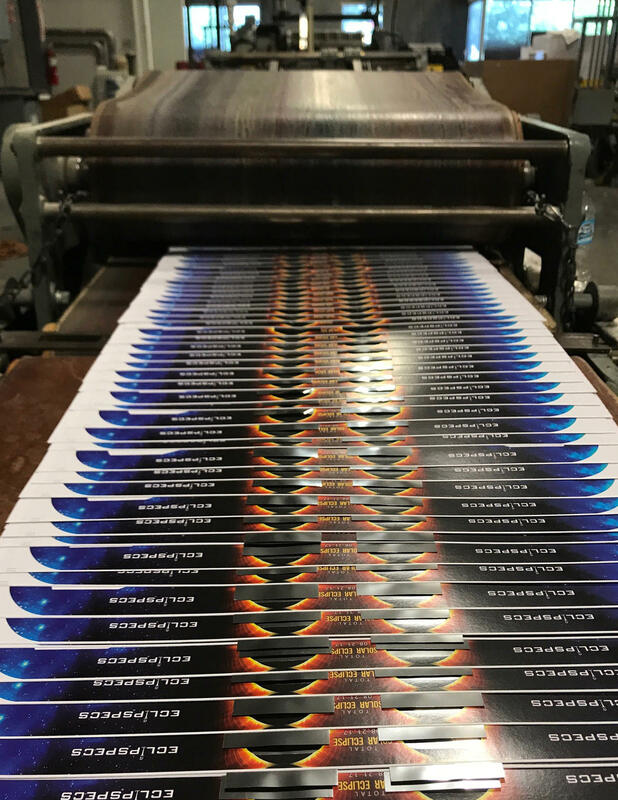 Eclipse viewers on the production line at an American Paper Optics facility. The company says it has already sold 65 million of these viewers for the upcoming total solar eclipse. When Ralph Chou was about 12 years old, he took all the right precautions to watch his first solar eclipse. "I did other stupid things, but when it came to looking at that eclipse, I was being very careful," says Chou, a professor emeritus of optometry and vision science at the University of Waterloo, who's a leading authority on eye damage from eclipse viewing. The upcoming total solar eclipse will be the 19th one he has seen after a lifetime of eclipse chasing. And Chou is worried about first-timers and other folks who might look up at the spectacle without much forethought. Tens of millions of people are expected to view the first total solar eclipse visible from the contiguous United States in nearly 40 years. "Unfortunately, I think it is probably true that during every solar eclipse, there's bound to be somebody who does get hurt," says Chou. The only time it will be safe to look with the naked eye is during the brief window of so-called "totality," when the sun is completely blocked by the moon. Totality will be visible only from a ribbon of land that stretches across the U.S.; the rest of the country will see only a partial eclipse. When any part of the sun is uncovered and the eclipse is only partial, viewers need eye protection — even if there's just a tiny crescent of sun left in the sky, Chou says. "That crescent of sun is glowing every bit as brightly as it would on a day when there isn't a solar eclipse," he says. "The difference is that instead of leaving a round burn on the back of the eye, it will leave a crescent-shaped burn at the back of the eye." Don't think it's safe to take quick, surreptitious glances, he warns. "Actually, those quick little glances do add up," says Chou, "and they can, in fact, accumulate to the point where you do get damage at the back of the eye." He says the damage isn't immediately apparent because the light-sensitive cells of the eye will keep working for hours after the injury before finally going kaput. Typically, people go home after an eclipse thinking everything is fine, says Chou. Then they wake up the next day and can't see. "Everything is really, really badly blurred right in the center of their vision," he explains. "So they can't read. They can't see faces. They can't see road signs." This kind of vision loss can get better over several months to a year. But about half the time, it's permanent, says Chou. It's impossible to say exactly how common eye injuries are among eclipse watchers. While doctors report cases in the scientific literature, no one is systematically collecting this information. But one thing is clear: Demand for eclipse glasses is unusually high, and companies have been cranking them out. "This eclipse, our goal is to manufacture close to a hundred million glasses," says Jason Lewin, director of marketing at American Paper Optics, which has a manufacturing plant outside of Memphis, Tenn. So far, they've sold about 65 million. Usually, the company will sell about 5 million glasses for a total solar eclipse. Such an event is visible from somewhere on Earth every 18 months or so. The company started planning for this eclipse about two years ago and hired around 60 additional workers. "We're going 24/7," says Lewin. "It's been wild." NASA has been urging people to buy eclipse glasses from a small group of companies whose products are known to conform to international standards written by Chou and others in the field. The concern is that scammers appear to be selling bogus products. 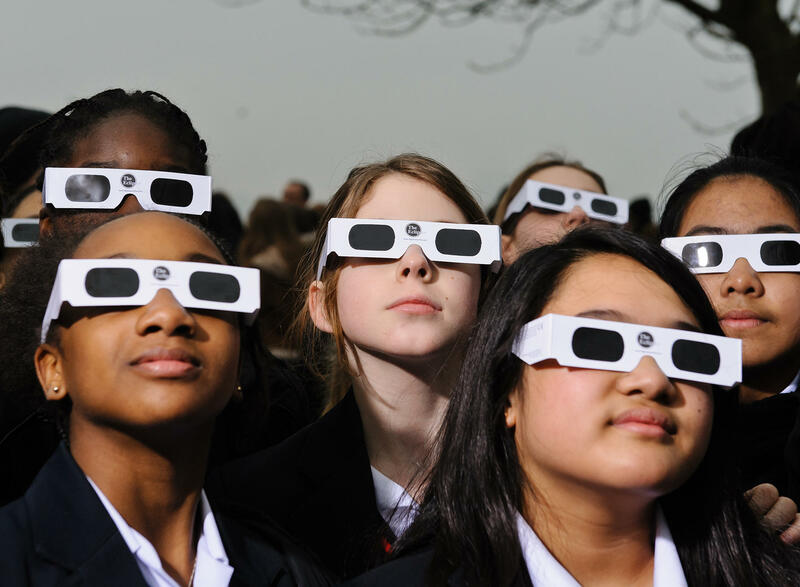 "We've seen examples of what appear to be ordinary sunglasses being sold as solar viewers, and that's horrible," says Rick Fienberg, an astronomer and press officer with the American Astronomical Society. "Customers are contacting us via our website and telling us, 'I've got these filters and they don't seem right. When I look at the sun, it's blindingly bright.'" He explains that real solar viewers are thousands of times darker than regular sunglasses. Fienberg is also concerned about fraudulent products made to look like the ones manufactured by reputable companies. "You can't just tell the public, look for this symbol or that symbol, because some people are printing those symbols on counterfeit products," he says. His society is contacting vendors and retail chains and compiling a list of legitimate sellers, so the public can buy eye protection that has been independently verified. He cautions that it is not OK to look at the sun through a telescope or binoculars while wearing eclipse glasses, because those kinds of optical devices need their own special filters. And no one should try to use makeshift, unsafe filters such as exposed film negatives, smoked glass or the silvery wrappers of potato chips or Pop-Tarts. Of course, there's another option: looking at a partial eclipse only indirectly. That's what Chou did when he was a kid, when he made a pinhole viewer to project an image of the eclipse onto a flat surface. "I was a geek. I admit it," says Chou, who notes that despite all the eclipses he has seen, he has never hurt his eyes. When you were a kid, at some point, someone probably told you not to stare directly at the sun, that you'll go blind. In less than three weeks, tens of millions of people will want to stare at the sun to see a total solar eclipse. It's the first in nearly 40 years that will be visible across most of the country, and NPR's Nell Greenfieldboyce reports the threat of eye damage is very real. NELL GREENFIELDBOYCE, BYLINE: Kids and teenagers can be reckless, but when Ralph Chou was about 12 years old, he took all the right precautions to watch his first solar eclipse. RALPH CHOU: I did other stupid things, but when it came to looking at that eclipse, I was being very careful. GREENFIELDBOYCE: Chou was so wowed by the site he became an eclipse chaser. He's seen 18 total solar eclipses. He's professor emeritus of optometry and vision science at the University of Waterloo in Canada who's an expert on eye damage from eclipse viewing. CHOU: Unfortunately I think it is probably true that during every solar eclipse, there's bound to be somebody who does get hurt. GREENFIELDBOYCE: He says the only time you can look up without special eclipse glasses is during the couple of minutes when the sun is totally blocked by the moon. When any part of the sun is uncovered, you need eye protection, even if there's just a tiny crescent sun left in the sky. CHOU: That crescent of sun is glowing every bit as brightly as it would on a day when there isn't a solar eclipse. The difference is that instead of leaving a round burn on the back of the eye, it'll leave a crescent-shaped burn at the back of the eye. GREENFIELDBOYCE: He says, don't think it's safe to take quick, surreptitious glances. CHOU: Actually, those quick little glances do add up, and they can in fact accumulate to the point where you do get damage at the back of the eye. GREENFIELDBOYCE: You won't notice right away. The way light-sensitive cells get hurt, they keep working for hours before going kaput. Chou says typically people go home after an eclipse thinking everything is fine. Then they wake up the next day and can't see. CHOU: Everything's really, really badly blurred right in the center of their vision. So they can't read. They can't see faces. They can't see road signs. GREENFIELDBOYCE: This kind of vision loss can get better over several months to a year. But about half the time, it's permanent. Chou says no one knows exactly how common it is for eclipse viewers to get hurt. The main thing is not to let it happen to you. And companies that make eclipse glasses have been cranking them out. JASON LEWIN: This eclipse, our goal is to manufacture close to a hundred million glasses. GREENFIELDBOYCE: Jason Lewin is the director of marketing at American Paper Optics, which has a manufacturing plant near Memphis. He says so far, they've sold about 65 million. LEWIN: And were going 24/7, seven days a week until, you know, until August 21, yeah. So it's been wild. GREENFIELDBOYCE: NASA has been urging people to buy eclipse glasses from a small group of companies like this one whose products are known to conform to international standards. Rick Fienberg is with the American Astronomical Society. He's worried about scammers who are selling bogus products. RICK FIENBERG: We've seen examples of what appear to be ordinary sunglasses being sold as solar viewers, and that's horrible. GREENFIELDBOYCE: Because what you need is thousands of times darker than regular sunglasses. He's also concerned about fraudulent products made to look like the ones manufactured by reputable companies. FIENBERG: And so you can't just tell the public, look for this symbol or that symbol because some people are printing those symbols on counterfeit products. GREENFIELDBOYCE: That's why he and his colleagues are contacting vendors and retail chains and compiling a list of legitimate sellers on the society's website so the public can buy eye protection that's been independently verified. Of course there's another option - looking at a partial eclipse only indirectly. That's what Chou did when he was a kid way back when. He made a pinhole viewer to project an image of the eclipse onto a flat surface. CHOU: I was a geek. I admit it. GREENFIELDBOYCE: He's never hurt his eyes despite all the eclipses he's seen. Nell Greenfieldboyce, NPR News.